This muruku too i did for sankranthi.This recipe is given by my neighbor.Myself and my sister did them at my sister's place. With all the above ingredients except oil,make hard dough using the warm water. Take the star design attachment of the muruku maker and apply oil and fix it into the maker. Grease the inside part of the muruku maker.Take small amount of the dough and close the muruku maker. Take a big plate or a plastic paper and rub little oil on that.Now press the muruku maker and form small spirals. Heat oil until piping hot and slowly leave muruku in small batches. Fry until light brown colour. Once all are done,let it cool and store in a air tight container. Murukkus look so crispy and crunchy. Love to have a few of those. Nice one Saritha looks crisp and yummm..
Crispy murukkus makes me drool,feel like munching some..
Murukku looks awesome love them. 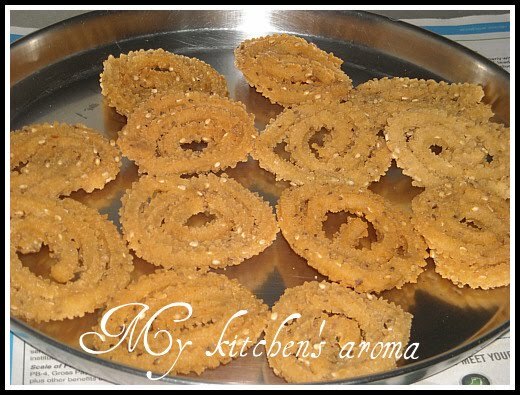 Crispy murukku and u have a wonderful blog dear...glad to follow u !!! first time here.. murukku looks crispy.. nice collection of recipes.. love to follow u! Crispy and delicious murukku,love to have this anytime of the day..wonderful blog,nice collection,glad to follow u..
Looks very tempting... has come nice shape and color.